School Wide Themes – Think Big! School themes can be unique to your school. Every school and each classroom has something special about it that can be celebrated through creative approaches to school wide themes. Your school deserves special recognition and themes are a great way to "umbrella" all these events under one hat. Think about school clubs, school dances, your science projects and your debate teams... There are always opportunities to conduct ceremonies commemorating these events and why not make them memorable by including all these milestones in your school theme. It can be exciting to promote school themes because they let you think BIG! Themes can be so much more than just an idea on a piece of paper. They can be real learning activities. A theme helps you create memories, reinforce purpose, mark special events and make promises about the future of student successes. It is not a surprise that most schools have tight budgets so it's important to be efficient when selecting and promoting your theme. All themes are "Ideas in Motion" so identify the creative talent in your school - then turn them lose. Sometimes a complicated theme idea can require extravagant expenditures which might be impractical. So choose carefully... You'll want to be sure you have the required resources to present your theme effectively. Whether your school is large or small... city or country... your themes must provide the biggest bang for your buck! Choosing among all the available school themes might seem to be a challenge. For, it is sometimes difficult to find common ideas that appeal to the majority of student activities. We present many options here and there are other great ideas on the internet. 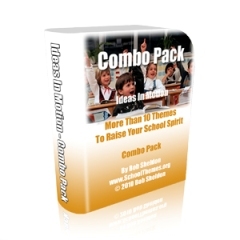 We even describe how to build your own school themes from scratch if you don't find one you like. Please click on 'Staff Picks !" in the left hand menu for our special time tested and proven instructions. Finding school themes that fit your school's culture, your students and staff can sometimes be difficult. But, if you enlist the assistance of your most creative staff members, share some guidance criteria and establish a few goals, you'll be amazed at what happens. 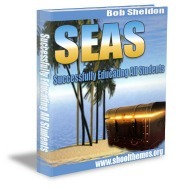 There are opportunities to make your themes relevant to multiple school activities. Think of special events such as fundraising, school dances, theatrical performances, band marches and sports games. Each of these can be tied to your theme concept and help you "promote School spirit" at the same time. School Wide Themes can come in several different flavors. There are online resources that will work with schools to help you choose the right theme if you're really having trouble picking one. They have professional experience using a variety of themes and can provide valuable insight about how different school themes create maximum results. 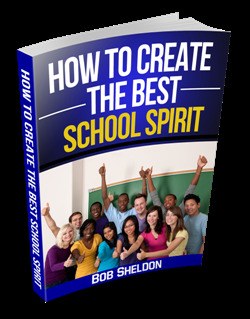 School wide themes are a great way for you to generate school spirit and create a supportive and cooperative environment. School themes can be part of the master plan - the plan to succeed. So remember to make your free school theme selection. Leave School Wide Themes and Get Your School Theme!